Beautiful baroque Freshwater pearls necklace with Initial. The Initial and clasp are 18/24K Goldplated. Wear it with or without the Initial. The Necklace is 50 cms long but if you want a different length please let us know when you place the order. 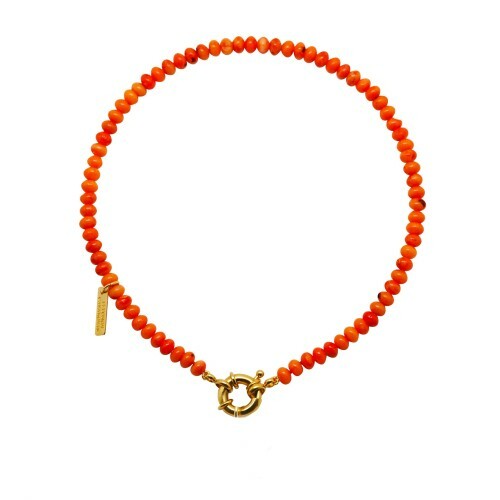 Beautiful Coral bamboo necklace with 18/24K Gold-plated clasp. The Necklace is 43 cms long but if you want a different length please let us know when you place the order. Beautiful baroque Freshwater pearls necklace with Initial. The Initial and clasp are 18/24K Goldplated. 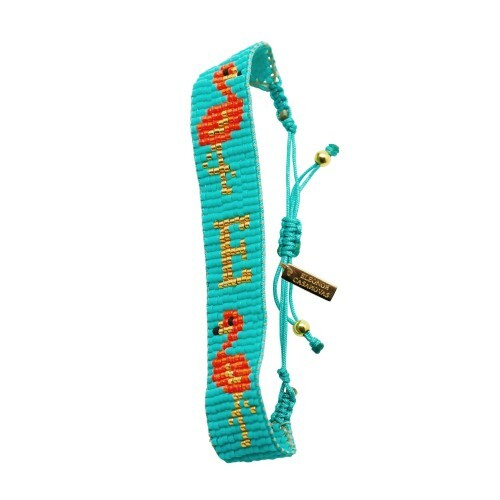 Wear it with or without the Initial. The Necklace is 43 cms long but if you want a different lenght please let us know when you place the order. 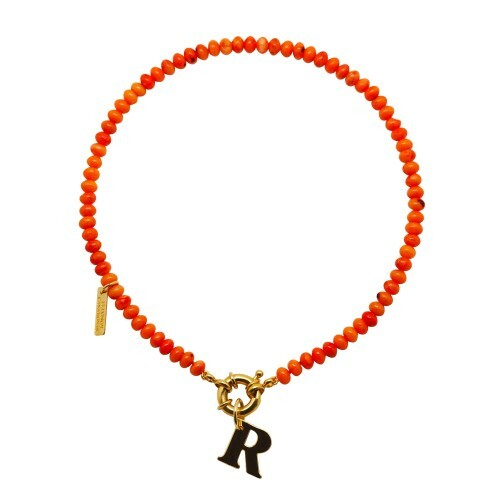 Beautiful Coral bamboo necklace with Initial. The Initial and clasp are 18/24K Goldplated. Wear it with or without the Initial. The Necklace is 43 cms long but if you want a different length please let us know when you place the order. "LOVE"charm letters Necklace with 18/24K Gold-plated link chain. The letters are 18mm high and you can close the necklace in any link of the chain. Beautiful baroque Freshwater pearls necklace with 18/24K Goldplated clasp. The Necklace is 43 cms long but if you want a different lenght please let us know when you place the order. 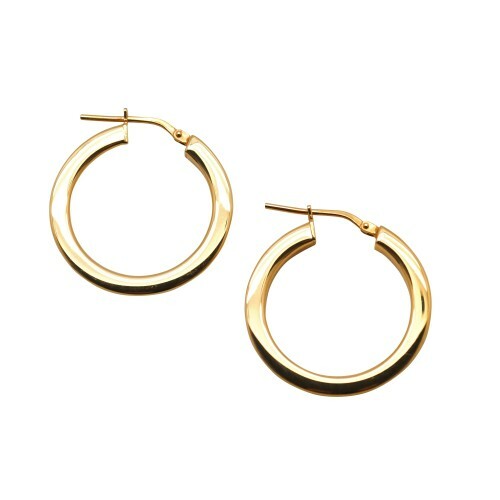 925 Sterling Silver Goldplated Hoop earrings. Hoop Diameter: 26 mm. 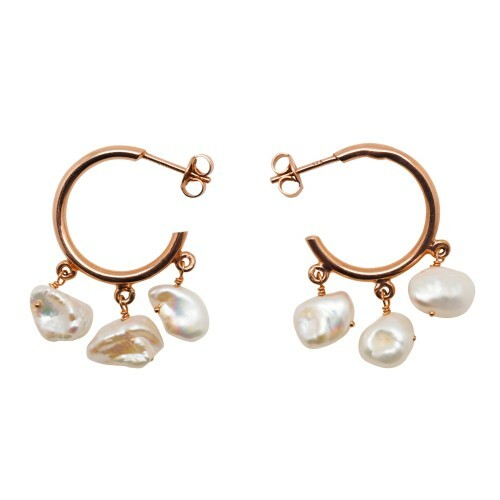 Baroque Freshwater Pearl Silver Roseplated hoop earrings. The hoop measures 18 mm wide. Please note each pearl is different and unique as they are natural. Big Baroque Freshwater Pearl Silver Roseplated hoop earrings. Please note each pearl is different and unique as they are natural. Hoop width: 43 mms. 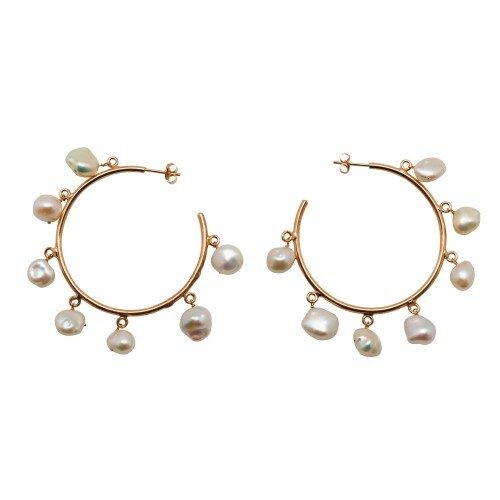 Baroque Freshwater Pearl hoop earrings. The hoop is Silver Gold-plated and measures 18 mm wide. The pearls are approx 1,5-2,5 cms long. Please note each pearl is different and unique as they are natural. Freshwater pearls Necklace with 18/24Ct Goldplated vintage lion charm. The necklace is approx 44cms long. 18/24 Ct Gold-plated chain with an Opaline tube. The chain is 45 cms long but closable in any chainlink. Available also Silver-plated. Lion Head necklace with thick chain. The chain measures 45 cms. Beautiful brass Gold-plated links necklace. The necklace is 43 cms long but you can close it at any ring of the chain. Sterling Silver 18/23Ct Gold-plated hoops with mother of pear Cross. Hoop diameter: 2,5 cms Cross height: 2 cms Available also in Sterling Silver. 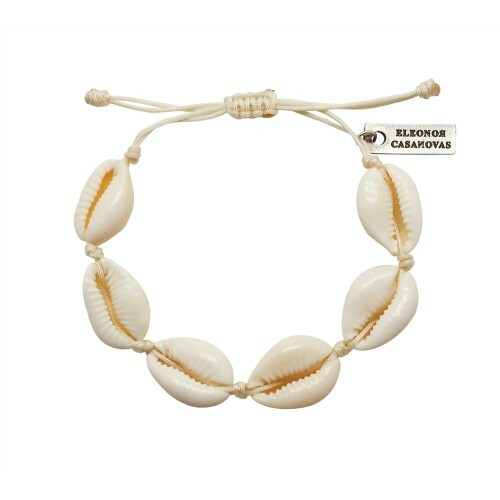 "Cowry Shell" necklace available 18 Kts Goldplated or Silverplated. The chain is 57 cms long with a ring to close also at 47 cms. 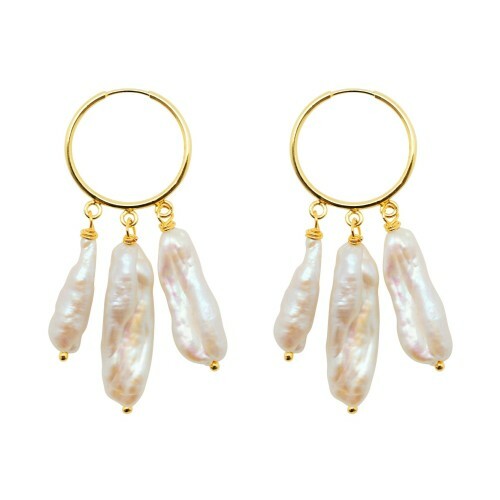 925 Sterling Silver Goldplated Hoop earrings with cowry shell. Hoop Diameter: 2,5 cms. Beautiful vintage brass Gold-plated link necklace. The necklace is 43 cms long but you can close it at any ring of the chain. 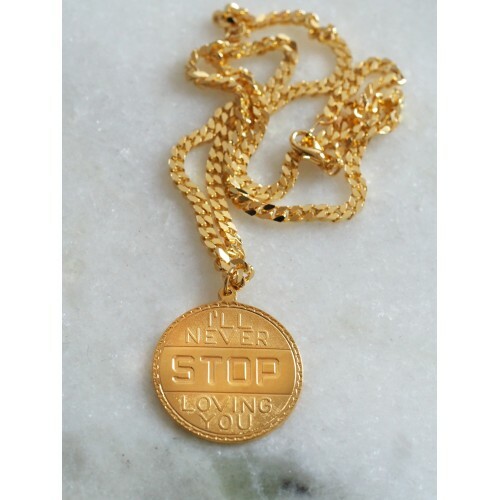 "I will never stop loving you" coin necklace available 18 Kts Goldplated or Silverplated. The chain is 54 cms long and the chain with coin is 9 cms long. "AMOUR" coin necklace available 18/24K Goldplated or Silverplated. The chain is 57 cms long with a ring to close also at 47 cms. Conch necklace available 18 Kts Goldplated or Silverplated. The chain is 57 cms long with a ring to close also at 47 cms. 925 Sterling Silver Goldplated Hoop earrings with charm. Hoop Diameter: 3,5 cms. Beautiful brass Gold-plated chain necklace. The necklace is 43,5 cms long. Beautiful brass Gold-plated Rings necklace. The necklace is 45 cms long but you can close it at any ring of the chain. Beautiful brass Gold-plated Circle choker necklace. The necklace is 45 cms long but you can close it at any ring of the chain. Stunning Buffalo Skull boho chic necklace with 18K Goldplated ring chain. Goldplated 5cms long monstera earrings with Turquoise and Coral. Stunning asymmetric lizard earrings with Silver 18K Gold-plated closure. The earring is 7,3 cms high including closure grasp. Beautiful Sterling Silver 18K Gold-plated Moonstone Horn earrings. 18K Gold-plated Sterling Silver earrings with tribal horn. The earrings are 5,5 cms long in total. 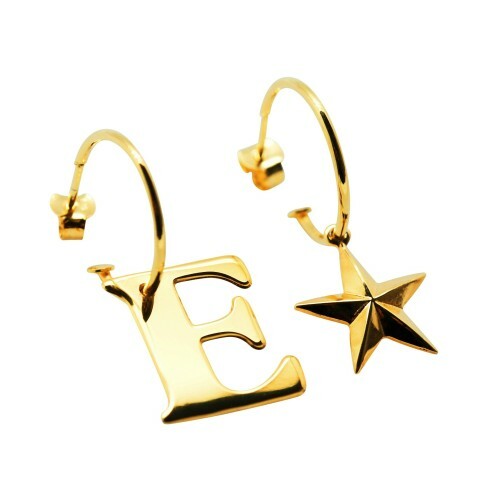 Sterling Silver Gold-plated hoop earrings with charms. Height: 3,5 cms. Antique Silver colour Horn necklace with thick chain. Black Buffalo Necklace with Silver colour thick chain. Stunning asymmetric Silver rosegoldplated with Blue Zircon pave Star earrings. 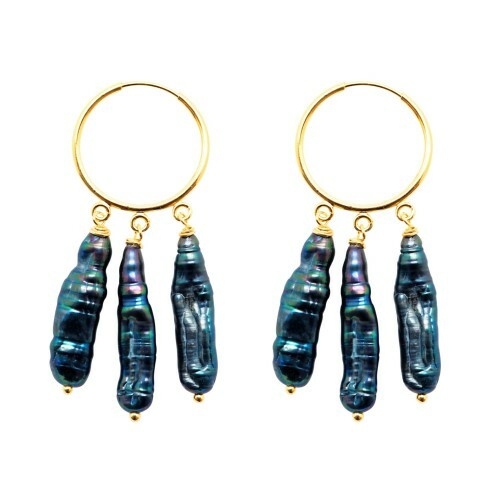 Beautiful Sterling Silver 925 and labradorite horn earrings. Beautiful Ethnic 18K goldplated Talisman pendant hangs from a Golden 63 cms long chain. 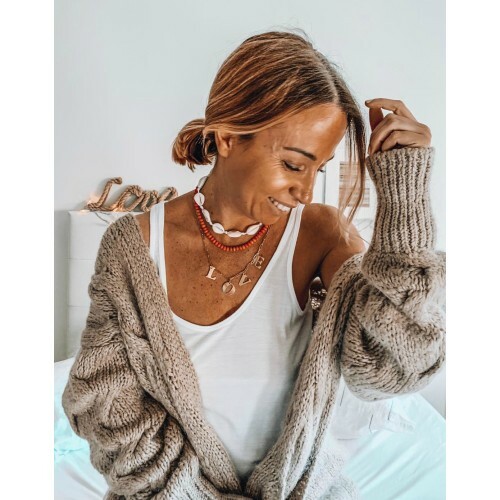 Wear it allone or layer with other necklaces. Blue Quartz point pendant. Please note each Quartz stone is different as it is natural stone. Brass 18K Gold-plated mini Spike pendant. The Spike is 2,5 cms high and the chain approx 50 cms long. Wear it alone or layer with other necklaces. Brass 18K Gold-plated Spike pendant. The Spike is 5 cms high and the chain approx 75 cms long. Wear it alone or layer with other necklaces. White and Pink Buffalo Necklace with Golden thick chain and 18K Goldplated Star. White and Turquoise Buffalo Necklace with Golden thick chain and 18K Goldplated Star. White and Turquoise Buffalo head with Goldplated star and Pink leather cord. Stunning Silver rosegoldplated with Blue Zircon pave Star earrings. 18K Goldplated Necklace with tropical leaf. The leaf is approx 8 cms long. Goldplated 5cms long monstera earrings. 18K Goldplated Necklace with tropical leaf. The leaf is approx 5 cms long. Sterling Silver 18K Gold-plated Arrow ring. Adjustable. Big Antiqued gold Ethiopian Cross pendant with Tribal Bronze beads and Black leather adjustable cord. The Cross is approx 9 cms high. 18K Goldplated brass Crescent moon necklace with 50cms long Golden chain. Hand stamped Name Necklace with "LOVE" brass blank and Silver Rhodiumplated chain with natural stones. If you prefer us to stamp your own word, please write it when you place the order. Stunning Boho Chic feather with 80 cms long Silver and Pyrite stone chain. Boho Brown feather pendant with swarovski and Brown leather cord. The feather is 11 cms long. Silver Gold-plated ring with double horn. Ring size: 14. Wear it in any finger! Sterling Silver 18K Goldplated ring with Dragonfly charm. Size 14. Wearable in any finger. Black Buffalo Head pendant with Black leather cord. White Buffalo Head pendant with Brown leather cord. Golden Seahorse pendant with white seashell and Golden ballchain. The seahorse is 37mm high. Approx chain length: 75cms. Seahorse with green patina pendant with Golden anchor and Golden ballchain. The seahorse is 37mm high. Approx chain length: 75cms.